There's a new port in town and it plans on replacing all other ports your Mac may currently have. Yes, we're talking about the USB-C port first introduced with the 12-inch MacBook, and then later, the 2016 MacBook Pros. The 12-inch MacBook currently supports only USB 3.1 Gen 1, which allows the port to be used for charging, video out, and USB 3 data. While the use of the USB-C port was slightly innovative, it’s the version on the 2016 MacBook Pro that you'll be seeing on new Macs to come down the road. The new USB-C ports support Thunderbolt 3 connectivity standards. Thunderbolt 3 can carry 100 watts of power, USB 3.1 Gen 2, DisplayPort, HDMI, VGA, and Thunderbolt data at 40 Gbps, all over a simple little USB-C port connector. You can say this is the one port to rule them all, and it means an end to all the ports we're used to seeing on our Macs, and for that matter, PCs as well. Another interesting tidbit: This is the first Mac, ever, to not include a proprietary port from Apple. Most of us who already have a collection of peripherals, from printers, scanners, and cameras, to external drives, displays, iPhones, and iPads, are going to need some type of adapter to make the connection to the new Thunderbolt 3 ports.. Peripheral manufacturers are hard at work creating new versions of their products with Thunderbolt 3 ports. That will make connecting your new Mac to these devices an easy prospect, with only one type of cable and no adapters needed. Monitors are already available with Thunderbolt 3, external enclosures, docking stations, and much more. Soon we'll see printer and scanner manufacturers jumping on the bandwagon, followed by camera makers and others. Until then, this guide will help you get your new Thunderbolt 3 Mac connected to older peripherals, as well as help those of us with older Macs make a connection, when possible, to new Thunderbolt 3 devices. Although this guide is written with Mac users in mind, the adapters and general information contained within will work equally well for any computing device using Thunderbolt 3 ports, so be sure to share this guide with your friends who use Linux or Windows. This type of adapter is available as a cable of varying lengths, with a USB-C connector on one end and a USB Type-A connector on the other. The other form this adapter takes has no cabling, just the two ports; one on each end. Either type is usable; it just depends on what you specifically need. Although USB Type-A will be the most common form for this adapter, there are smatterings of adapters that forgo the standard Type-A connector for the USB Type-B or micro-USB connector. You can use this type of adapter to connect a Thunderbolt 3 computer to standard USB 3, USB 2, or even USB 1.1 devices. This includes flash drives, cameras, printers, and more. You can even use this adapter to connect to your iPhone or iPad, provided you also have a Lightning to USB adapter. One note about these adapters: the speed is limited to 5 GBps, the same as USB 3. If you want to connect a USB 3.1 Gen 2 device that can support 10 GBps, see the Thunderbolt 3 to Thunderbolt 3 entry, below. This type of adapter is ideal for connecting your Mac or PC to the HDMI input of a display or TV. This type of adapter is for basic HDMI supporting a 1080p signal at 60 Hz. You can find some that will output a UHD (3840 x 2160), but only at 30 Hz. If you're looking for an adapter to handle a 4K or 5K display at 60 Hz, you'll need an adapter that supports DisplayPort connectivity. Simple VGA adapters are available that provide a VGA signal to a display; they tend to be limited to 1080p. Once again, for a higher resolution look to the DisplayPort adapters. This adapter is the one you're looking for if you need DisplayPort or DVI connectivity. This type of adapter can support 4K Single-Stream Transport displays, as well as 5K/4K Multi-Stream Transport. I mentioned earlier that a Thunderbolt 3 to USB adapter could work with the Lightning to USB adapter you may already have for your iPhone. But you may consider it a bit of kludge to use two adapters to make a single connection. The fewer connectors and adapters in line, the less chance there is for a failure. Thankfully, there's a single adapter you can use available from Apple, as well as a few third parties. If you already have Thunderbolt 2 or Thunderbolt 1 devices, this is the adapter you need. Surprisingly, the best offering out there, at least at the moment, comes from Apple, which offers a bidirectional Thunderbolt 3 to Thunderbolt 2/1 adapter at a low price. This Apple adapter also works for connecting Thunderbolt 2-based Macs to Thunderbolt 3 peripherals. But before you say yippee and run out to buy this adapter and that newfangled Thunderbolt 3 device, make sure the Thunderbolt 3 peripheral will work with a Thunderbolt 2 Mac. The Thunderbolt 3 specification says it's backward compatible with the older Thunderbolt 2. But more than one manufacturer has said that its Thunderbolt 3 peripherals are not compatible. The reason seems to be twofold; first, some early USB-C controller chips seem to have a backward compatibility issue; and second, a Thunderbolt 3 peripheral, while using a Thunderbolt 3 port, isn't actually using the Thunderbolt data channels; instead, it's making the connection over the USB 3.1 Gen 2 channels. Thunderbolt 2 was never compatible with USB, so this arrangement, even with an adapter, won't work. If you need to connect a FireWire 800 or FireWire 400 device to a new Mac using the Thunderbolt 3 port, you're in for a kludge of adapters. At the moment, there's no direct Thunderbolt 3 to FireWire adapter available, and we doubt one will ever be made. However, Apple makes a Thunderbolt 2 to FireWire 800 adapter, which you could combine with the Thunderbolt 3 to Thunderbolt 2 bidirectional adapter mentioned above. If you need FireWire 400, then you'll have to add another item to the mix: a FireWire 800 to FireWire 400 adapter. We're told this will work, but our suggestion is this: if you must do this to access some stored data on a FireWire device, quickly copy it to a new storage system and retire your FireWire system. If your goal is to keep a FireWire-based video or audio editing system working, this conglomeration of connectors and adapters may not prove dependable. Our recommendation is to upgrade to something newer and better supported. This is the type of cable is used for connecting a Mac or PC with Thunderbolt 3 to any Thunderbolt 3 device; displays, storage, what have you. It can also be used for daisy chaining one Thunderbolt 3 peripheral to another. Don’t be fooled by cables that have a USB-C connector at each end; this doesn't signify the cable is a Thunderbolt 3 cable. It could be a USB-C cable supporting USB 3.1 Gen 1 or Gen 2 signals. You can tell the two types of similar-looking cables apart by examining the USB-C connector; you should see a single lightning bolt logo for Thunderbolt cables. You can use the Thunderbolt 3 to USB 3 adapter listed above to connect to USB 3 devices. However, if you want to save a little bit of cost, USB-C to USB-A adapters are slightly less expensive. You can use the Thunderbolt 3 to Thunderbolt 3 cable to make this connection, but if all you need is USB 3.1 Gen 1 or Gen 2 connectivity, you can save a bit with this less expensive cable. Just remember this cable may not work when used with Thunderbolt 3 devices. You can identify this cable by looking at the connector. If you see a SuperSpeed logo (SS), then the connector supports USB 3.1 Gen 1. If you see a SuperSpeed+ or SS 10 logo, then the cable supports USB 3.1 Gen 2. This type of cable is designed just for charging and running power to devices. 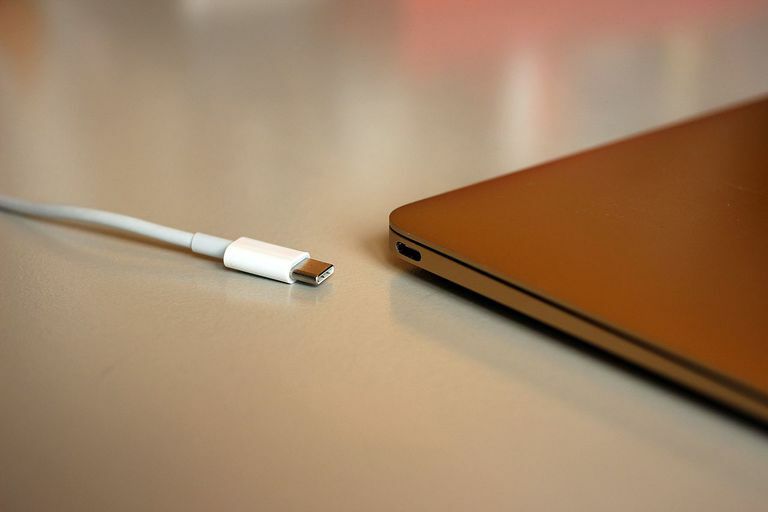 The charging specification for Thunderbolt 3 and USB-C allows up to 100 watts of power that can be delivered to the connected device. New Macs, such as the MacBook Pro, come with a charging adapter and the needed cable, however, if you need a new charging cable, you can look for one labeled to use for charging. But if push comes to shove, a standard USB-C to USB-C or a Thunderbolt 3 to Thunderbolt 3 will work for charging purposes as well. Thunderbolt 3 is fast, versatile, and without a doubt, well on its way to being a universal connection for most things you can attach to a computer. Apple has gone whole-hog, ripping out legacy ports and replacing them with Thunderbolt 3. The only non-Thunderbolt port is the headphone jack, and even that will go away someday, replaced entirely by wireless connections or third-party Thunderbolt docking stations with headphone and microphone inputs. PCs will likely hang onto legacy ports for a while longer, but even those will give way to Thunderbolt 3 or its later incarnations. At some point, adapters will become harder to find as more Thunderbolt-based peripherals flood the market. If you plan on keeping your current Mac or PC for a bit, we suggest stocking up on adapters while they're plentiful and inexpensive. Does My Computer Support USB 3.0?